First Look…3 reasons you should do it! Let’s talk about the First Look. You may have heard the term before, but in case you don’t know what the heck I’m talking about, let me explain. A First Look is when the Bride & Groom have a special moment together where they see each other prior to the Ceremony. We set it up so the Groom is looking away, and the Bride is able to walk up to him and tell him to turn around. He then gets to see her in her gown for the first time, and they get to spend a few moments uninterrupted, before the hustle and bustle of the formal Ceremony happens. For most of you Southern Brides & Grooms, this is a big no no in your mind. You hold to the tradition that you shouldn’t see each other before the Ceremony. Most believe it to be bad luck, or that it will take away from the moment you see each other as the bride walks down the aisle toward her soon to be husband. And I get it! There is something to be said for a tradition! It gives you warm fuzzies, and all the good feels. So why am I trying to talk you out of it?? Here are THREE reasons why I think you should include a First Look in your Timeline! One. A private moment to appreciate each other. Your Wedding Day arrives. You have butterflys in your tummy, your anxiety levels may start to rise a little as you think about standing in front of 100’s of people, declaring your love. You’re excited, but nervous! What if I told you, there was a way to relieve some of that anxiety?? Take some of the pressure off?? You get to see your Bride To Be, without hundred’s of eyes watching you. Twirl her around and tell her how absolutely stunning she looks. Spend a few romantic moments together just reveling in the fact that TODAY you become Husband and Wife and embark on one of the most exciting journeys of your life together. At the alter you don’t get the satisfaction of telling your soon to be wife how gorgeous she looks. She doesn’t get to hear how much you love her dress, and just how in awe you are of the fact that you get to marry her. This gorgeous creature standing before you, you get to MARRY HER! Having a romantic moment together can’t really happen with all eyes on the two of you. 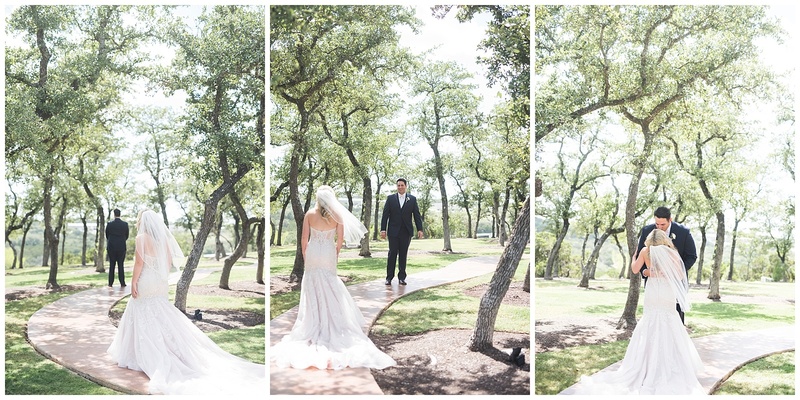 But during a first look…we send everyone away… it is just the two of you (and us lol!). There aren’t many days where you get to dress up to the nine’s, with professional makeup and hair. Or for you Gents out there, most of you aren’t in a suit/tux lookin all dapper everyday either! I hear you! But I 100% believe that the reason most people fear the camera, is because they fear not knowing what to do in front of it. Shake and Bake this feeling off! I am here for you! I guide you thru, and if you’ve had an Engagement Session with me, you are already aware of this! Almost all of my Grooms, after the Engagement Session, tell me “Oh! That was actually fun!” (which is totally my goal y’all!). After it’s all said and done, these are the pictures you are going to go thru to bring you right back to the most perfect day. The day you married your person. Texas is fickle y’all…if you’re from here you get it. One day it can be 104 outside, and then next it’s 70. One day it’s bright and sunny, the next it’s pouring. You can’t even rely on the weather app around here! I have had multiple sessions nearly get called because of weather, with a forecast of 90% chance of rain, only to have it clear up the hour before…yea Texas is unreliable when it comes to weather. But! If you plan a First Look, and the forecast is showing possible storms in your future, your portrait time can be saved! If we are able to get it in early in the day, if it rains or storm clouds are looming making it too dark at Golden Hour, you are still in the clear because we knocked out portraits during the first look! This literally happened to us last weekend, and I am so thankful they chose a First Look! If they had waited for sunset picture time, their formal portraits wouldn’t have been the same! The clouds had made it so dark that it would’ve been a struggle for us all (especially if you really love the natural light images you see all over my website/portfolio). A first look insurances that you have portraits on your wedding day! So throw caution to the wind, let the old tradition go, and take the First Look plunge! CLICK HERE TO READ TIPS FOR YOUR WEDDING DAY!